It’s such a strong word. And we’re constantly being asked to have bucketloads of it! Faith in yourself, faith in other people. Faith that everything will come good. Faith that we can overcome any obstacle – especially if we have faith in a powerful creator. It’s a comforting word, meant to inspire, transform, calm and motivate. So you can wear this brooch with pride. 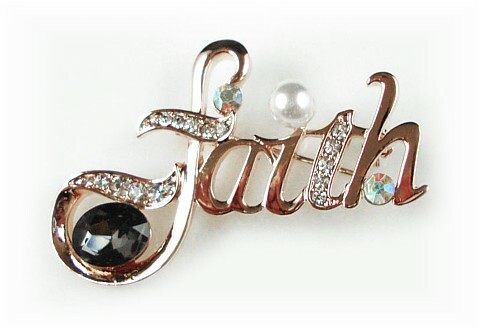 It’s gorgeous anyway, with tiny sparkling crystals and a pearl enhancing the word – beautifully. Size: 5 x 3.5cm (2” x 1½”).